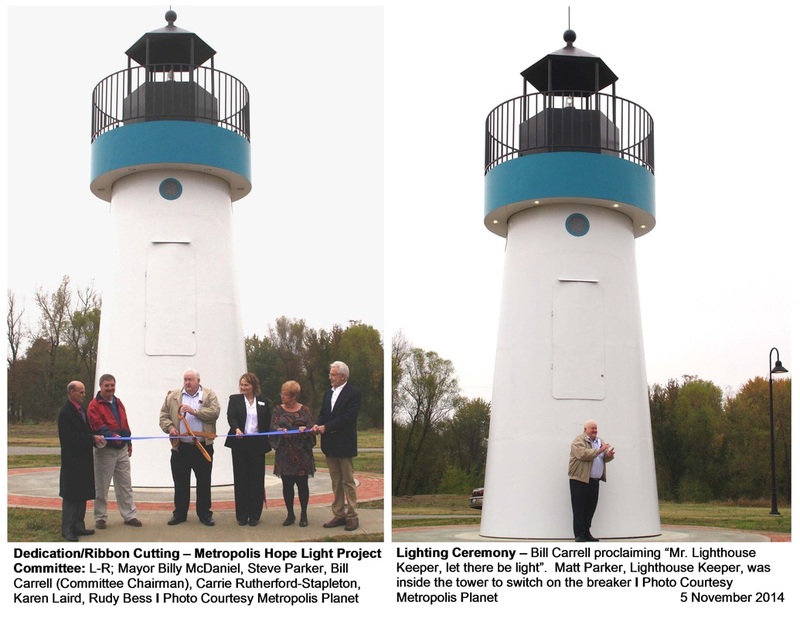 Metropolis, IL, Wednesday, 5 November 2014 - The Metropolis Lighthouse "Hope Light" was officially dedicated to the fight against cancer and lit on 5 November 2014 at a ceremony in Dorothy Miller Park overlooking the Ohio River in Metropolis, Illinois. 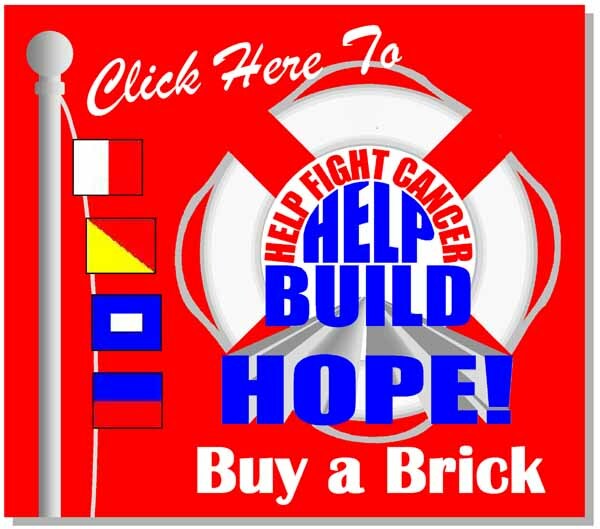 It was a cold, misty, foggy and overcast day when dozens of people gathered on the river bank to witness lighting of the worlds first lighthouse designed for, built for and dedicated to the fight against cancer. Dorothy Miller herself, was a victim of cancer. 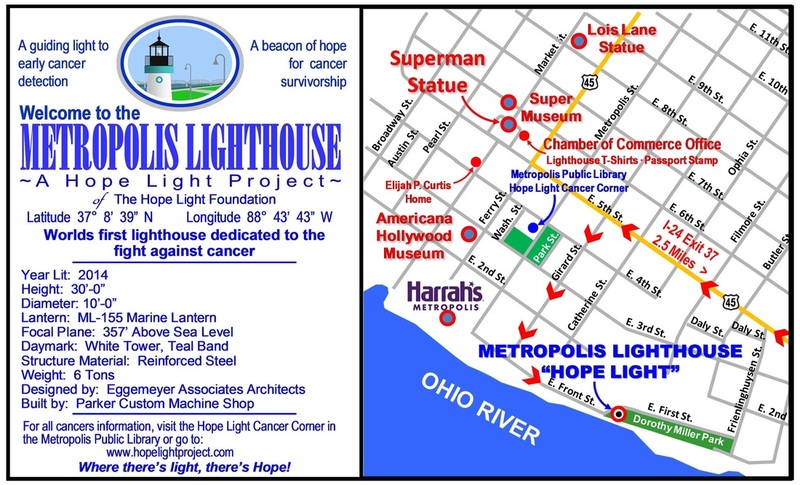 The lighthouse will be the nations "Beacon of Hope" for cancer patients and survivors. 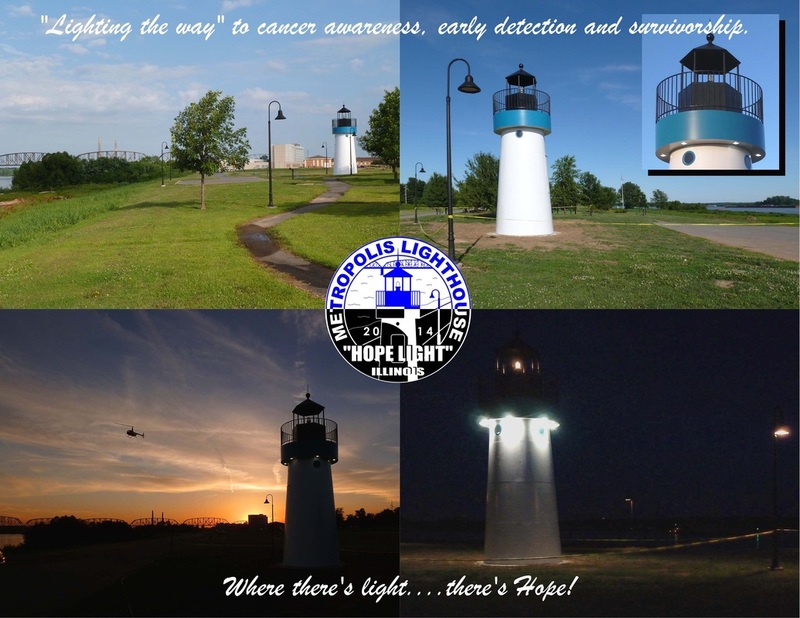 The main purpose of the lighthouse is to promote early cancer detection and navigate people to various resources that identify cancer signs and symptoms and where to go for help. If detected early, cancer could be diagnosed and treated with hope for survivorship and an eventual cure. 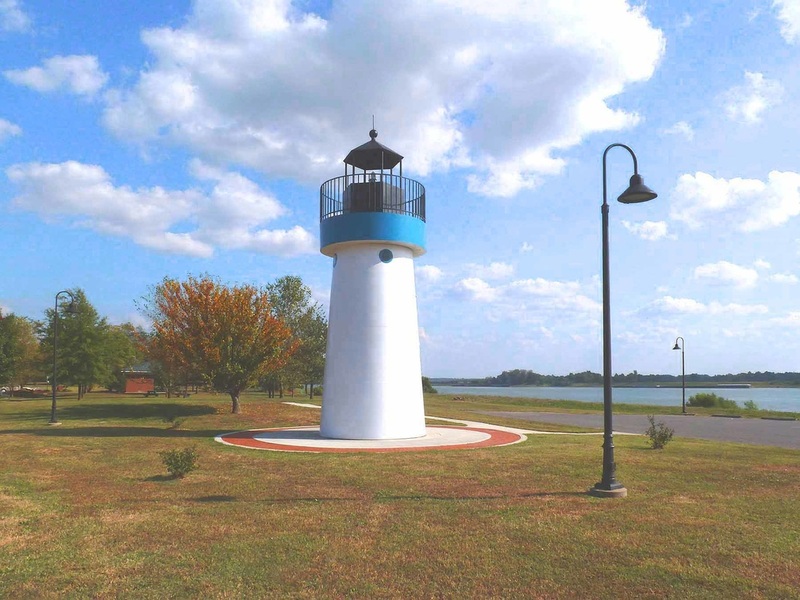 The 30 foot tall lighthouse is designed to resemble a real lighthouse and contains a modern lighthouse beacon. 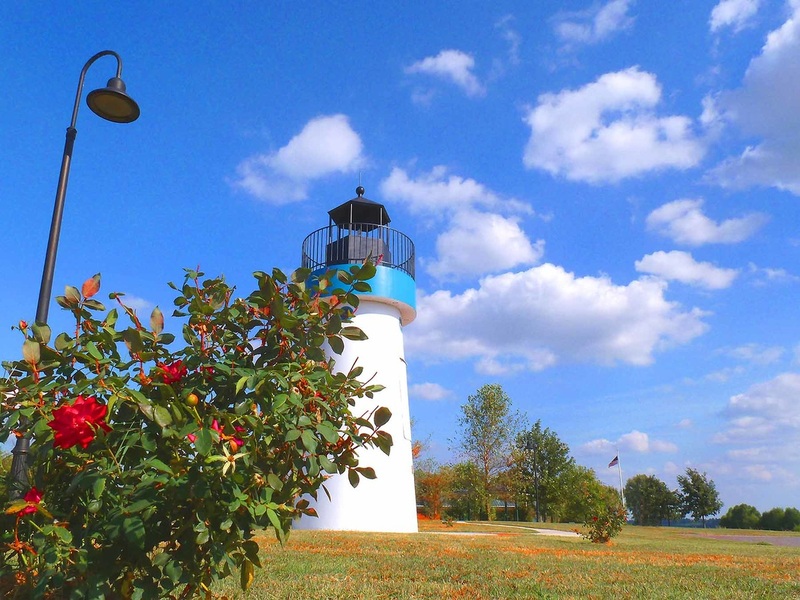 The lighthouse was constructed entirely using donated funding and pro bono labor, services and supplies. It has been designated as an official Illinois Tourism Attraction. The ceremony began with a welcome aboard by Metropolis Mayor Billy McDaniel followed by comments from Bill Carrell-Chairman of the Metropolis Hope Light Project Committee, Mark Dillon-CEO/President of Eggemeyer Associates Architects, and Rudy Bess-Founding Director of The Hope Light Foundation and a ribbon cutting by Bill Carrell. Upon the words "Mr. Lighthouse Keeper, let there be light", spoken by Bill Carrell, Matt Parker switched on the beacon from inside the lighthouse which drew a heavy applause from the onlookers. 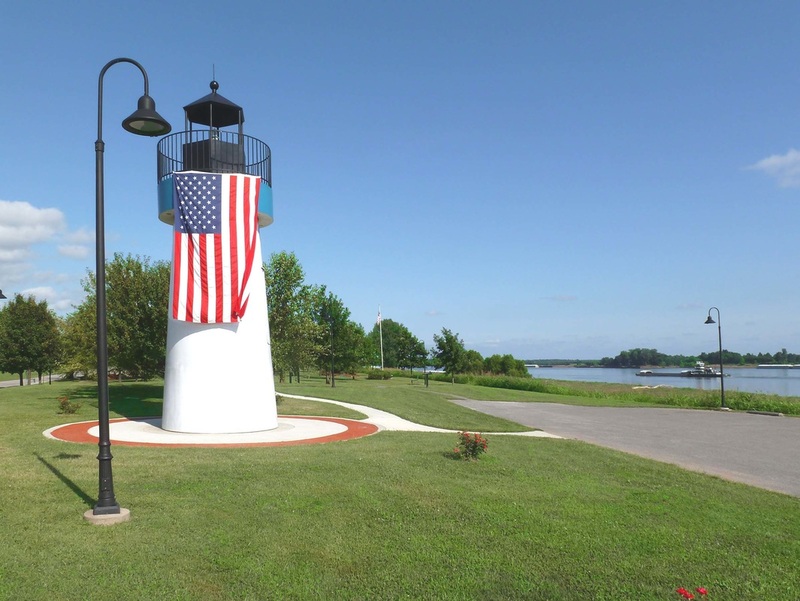 As Mayor McDaniel stated in the dedication ceremony, "this lighthouse will be a permanent fixture on this site for generations to come". He later stated "I don't know of anywhere in the world that you could go to find a better view of what goes on in a river community than at this particular spot". This location is definitely a special place with a special meaning for a special lighthouse! Click on photo to view the dedication video broadcasted on WSIL TV. 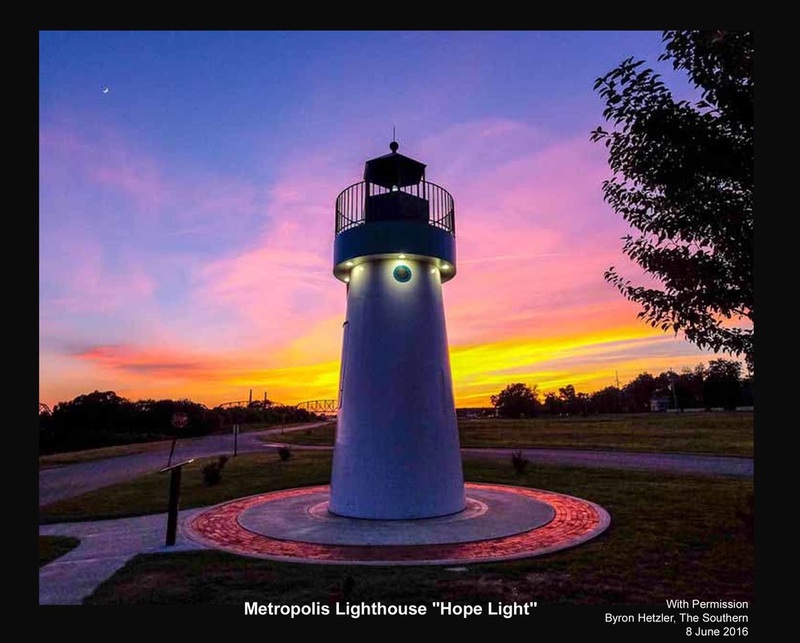 Metropolis, IL, Friday, 6 June 2014 - The Metropolis Lighthouse "Hope Light" was lit up with all its lights shinning for the first time tonight. The beacon is an ML-155 Marine Lantern with a five mile visibility. The light stands 30 foot tall as measured from its base to the top of the ventilator ball. The project still has some work remaining to include constructing concrete walkways and laying the personalized paver bricks. Metropolis, Illinois, Friday, 6 June 2014 - The Metropolis Hope Light was erected on Wednesday, 4 June 2014, in Metropolis, Illinois at the entrance to the beautiful and peaceful Dorothy Miller Park overlooking the Ohio River. This lighthouse is the first one in the world that is exclusively dedicated for use in the fight against cancer. 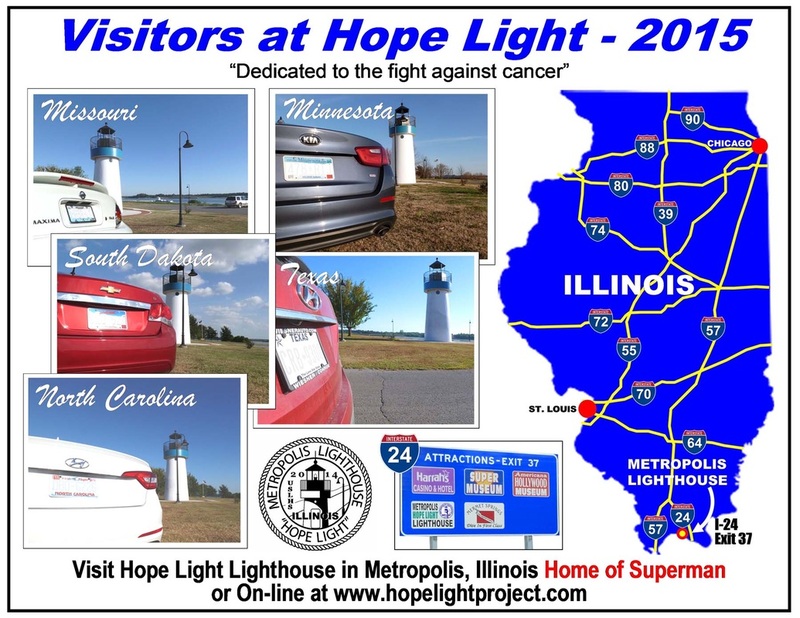 The lighthouse will become a symbol for promoting cancer prevention and early detection as well as a "beacon of hope" for cancer patients and survivors. 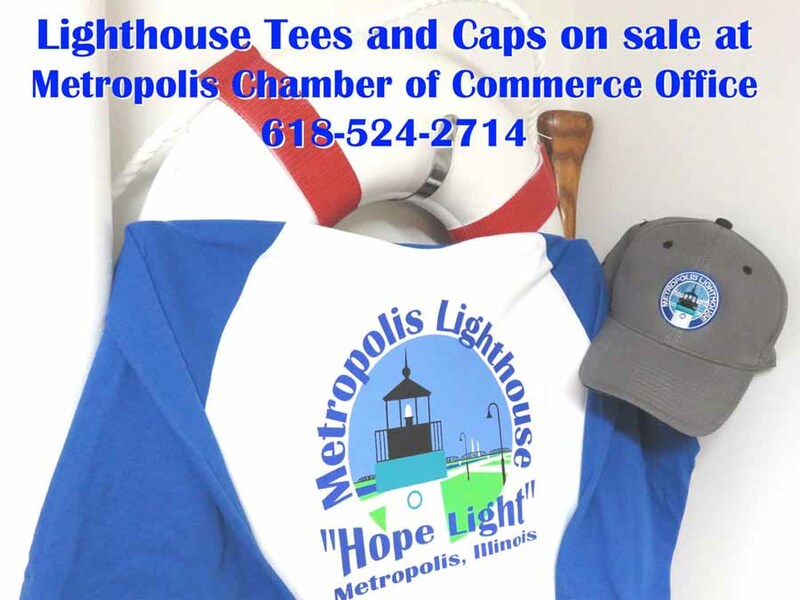 For years lighthouses have become symbols of hope as guiding lights to navigate ships from rough waters and dark seas to the calm waters of a safe harbor which is synonymous with the meaning of the Metropolis Hope Light. The teal daymark band represents the fight against ovarian cancer although the lighthouse is dedicated to the fight against all cancers. The black lantern room represents the dark and rough journey experienced by cancer patients. 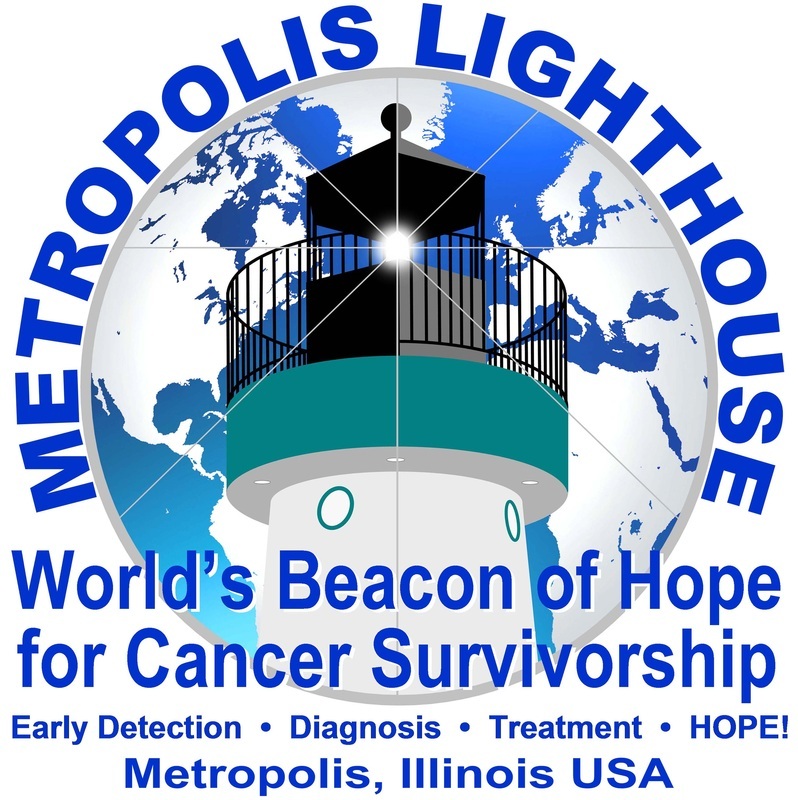 The white-light marine lantern in the lantern room represents a guiding light to a safe and secure harbor and 'hope' for survival of all cancer patients and a cure for all cancers. 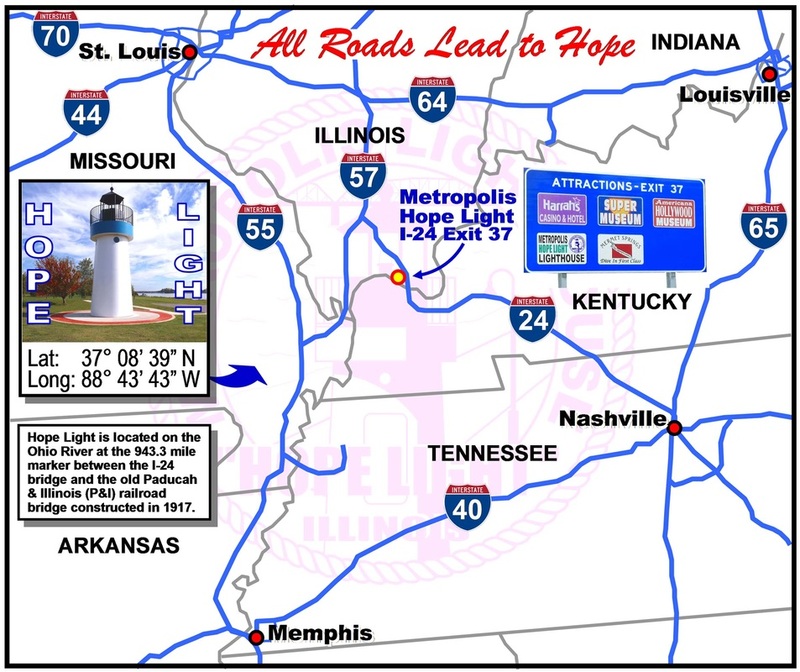 Metropolis, IL, Monday, 2 June 2014 - The Metropolis Lighthouse "Hope Light" will be erected on its foundation in Dorothy Miller Park on Wednesday morning, 4 June 2014 beginning at 7:30 am. The 6 ton lighthouse will be arriving at the site Wednesday morning in two sections; the 20' high tower on one trailer and the 12-1/2' high lantern room and daymark band on another trailer. 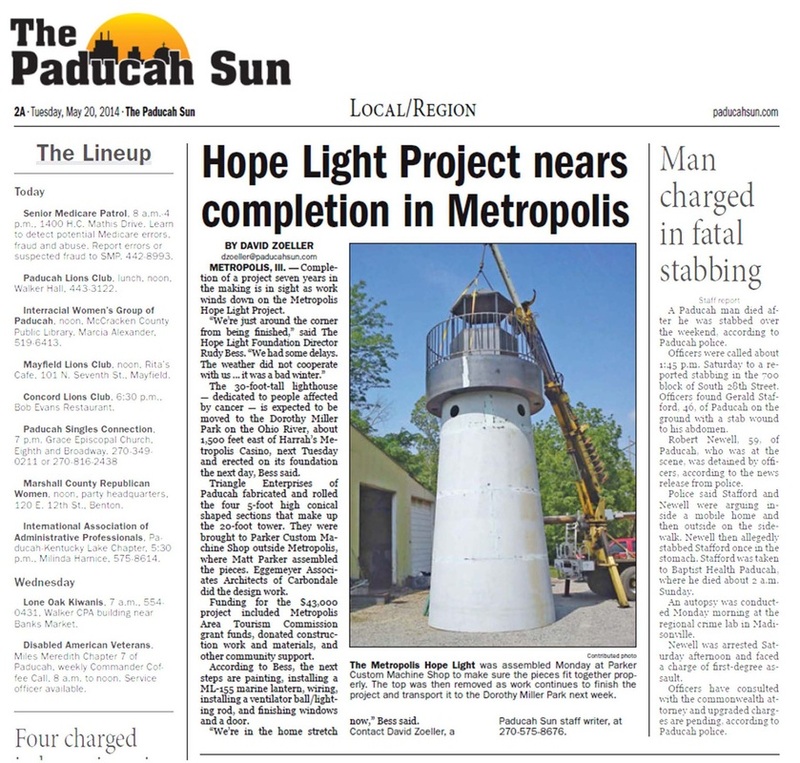 A crane from Mizell Crane in Paducah, KY will be arriving at 7:30 to lift the tower on the foundation and the lantern room on top of the tower. When assembled, the lighthouse will stand 30 foot high as measured from the base of the tower to the top of the ventilator ball atop the lantern room. Previously planned lighthouse erection dates were cancelled due to rainy and stormy weather, however, weather reports for Wednesday appears to be favorable for lighthouse lifting and installation operations. 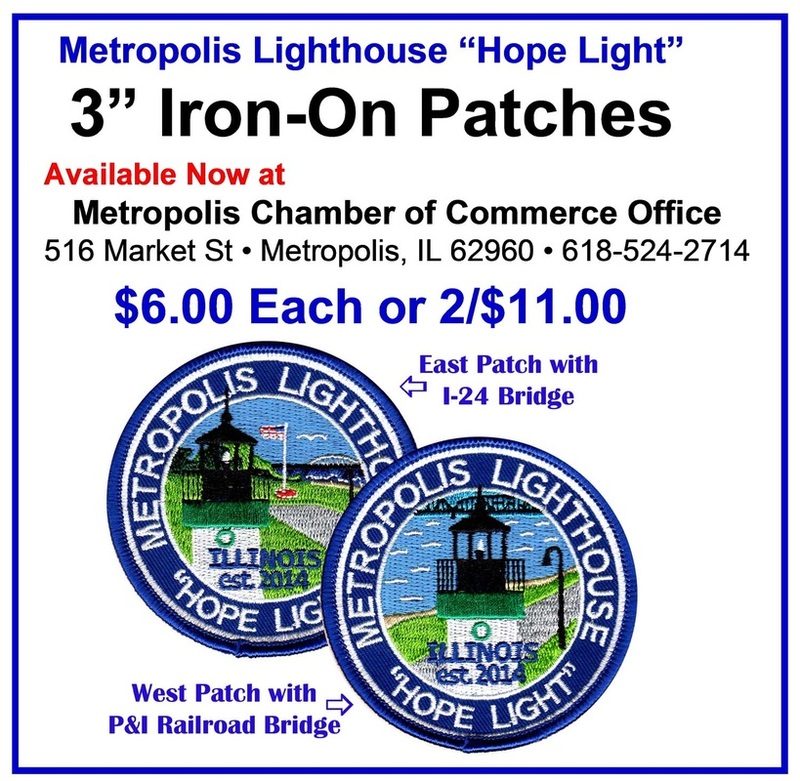 Metropolis, Illinois, Tuesday, May 13, 2014 - The Metropolis Lighthouse, aka Hope Light, is nearing completion at the Parker Custom Machine Shop outside Metropolis. 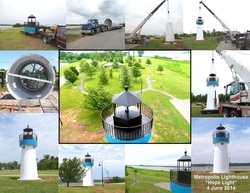 Both the tower and the Lantern room will be transported to the site at the entrance to Dorothy Miller Park on May 27 and erected on the foundation on May 28. Once erected, the lighthouse will be 30 feet tall as measured from the tower base to the top of the ventilator ball above the lantern room. Metropolis, Illinois, Sunday November 24, 2013. 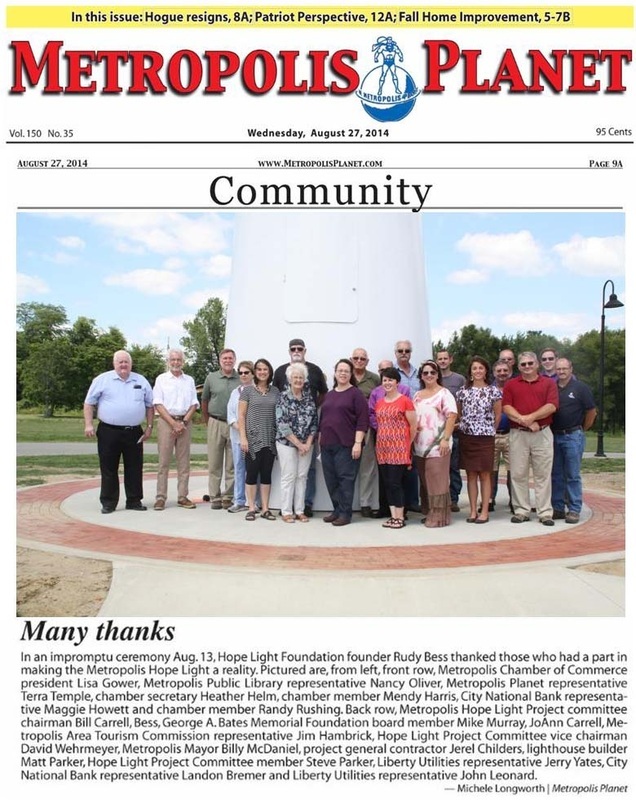 Thanks to some good weather recently, the concrete pad for the Metropolis Lighthouse (Hope Light) has been completed and is ready for installation of the lighthouse in Dorothy Miller Park. The photo shows the rebar structure in the upper left and the finished concrete pad in the upper right. The lower photo depicts the 10' high lantern room alongside the 20' high tower at the Parker Custom Machine Shop in Metropolis. Due to weather delays and technical difficulties in fabrication, the project completion date is to be determined at this time. Click on above for full article. 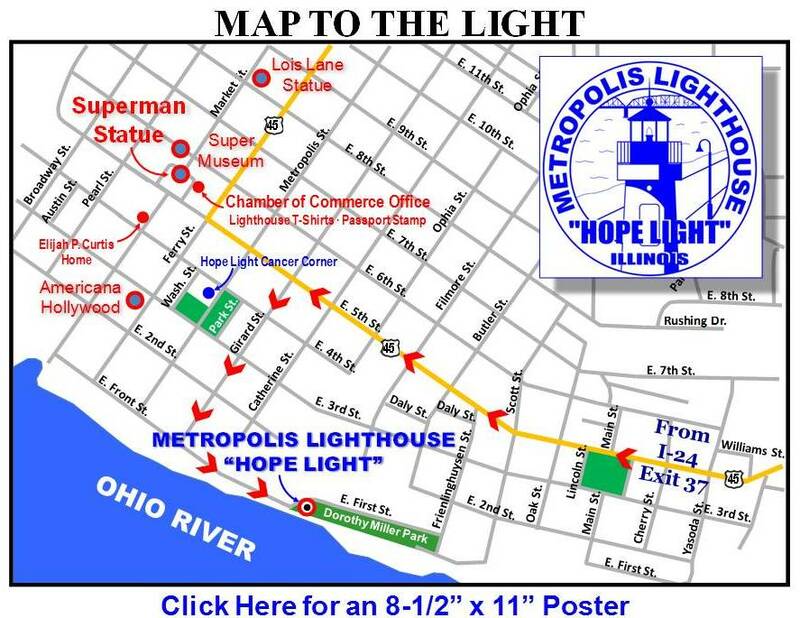 Metropolis, Illinois, Thursday September 26, 2013 - Due to underground water and sewage lines discovered in the previously planned location, the Metropolis Lighthouse will now be located at the entrance to the Park as shown in the photo. This location, at the intersection of First and Front Streets, will provide more room for future expansion of the circular walkway around the lighthouse and for addition of park benches and greenery. Access to the lighthouse will be from both the parking lot to the south and from the existing park walking path to the east. Excavation and concrete work at the site is expected to begin next week. Metropolis, Illinois, Friday September 19, 2013 - The Metropolis Lighthouse Lantern Room begins to resemble one for a real lighthouse in The Parker Custom Machine Shop facility in Metropolis. 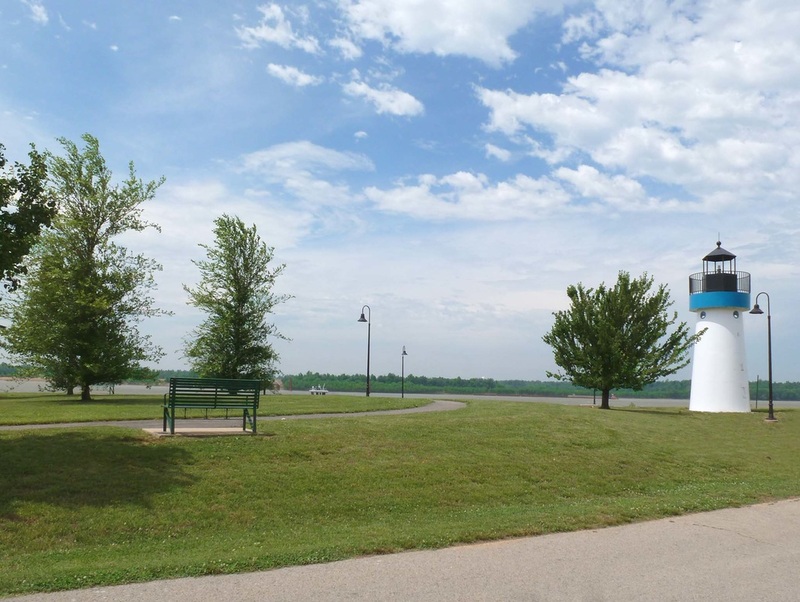 The lantern room and daymark enclosure shown in the photo to the left will set atop the 30 foot high lighthouse to be constructed at the entrance to Dorothy Miller Park on the Ohio River Bank in Metropolis. The lantern room will contain a ML-155 Marine Beacon with a white light. A yet to be installed cupola with ventilator ball and lightning rod will be located atop the lantern room. Metropolis, Illinois, Tuesday August 28, 2013 - Parker Custom Machine Shop in Metropolis has begun construction of the Metropolis Hope Light (lighthouse). The photo to the left shows the interior view of three conical sections adjoined to form the 20' high, 10' diameter tower that will be supporting the 10' high lantern room. 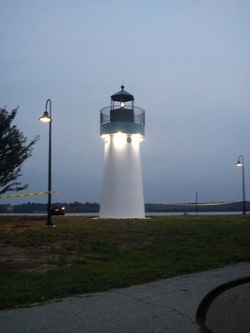 This is the first photo of the lighthouse that is being built in the Parker facility. 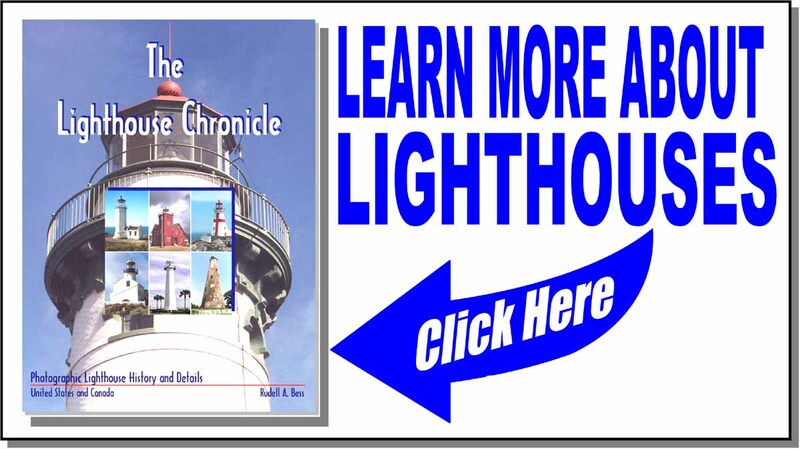 We will keep you up-to-date on the lighthouse project as it unfolds. Metropolis, Illinois, Monday, August 26, 2013 - The Metropolis Hope Light, a 30' tall conical shaped, white steel lighthouse, with a teal daymark band and black lantern room with a white-light marine lantern will be constructed in September 2013 in Dorothy Miller Park on the Ohio River. The teal daymark band beneath the black lantern room represents the fight against ovarian cancer. The black lantern room represents the dark journey of cancer patients into the unknown as they begin treatment. 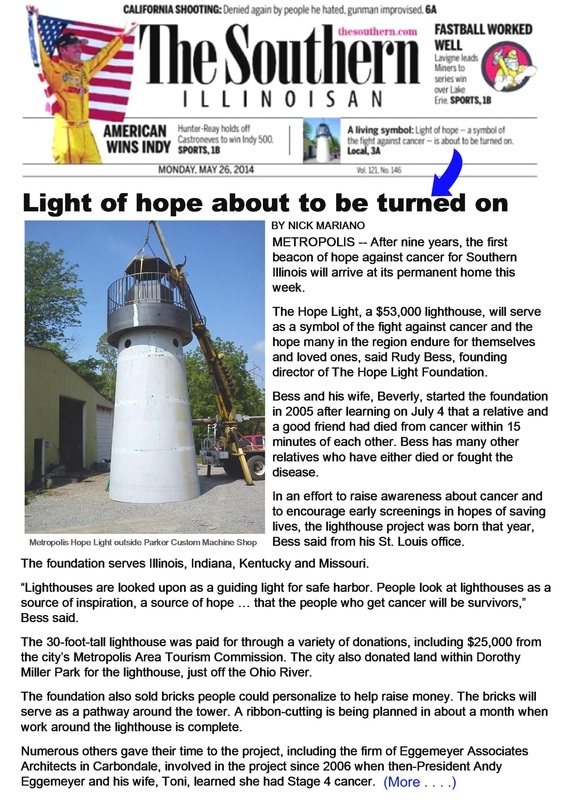 The white light in the black lantern room represents Hope that cancer treatment will lead to survivorship as a lighthouse shines the way to a safe harbor in a dark and stormy night. This is our story and survivorship is our Hope for each cancer victim. "Once you choose Hope, anything is possible" - Christopher Reeve. 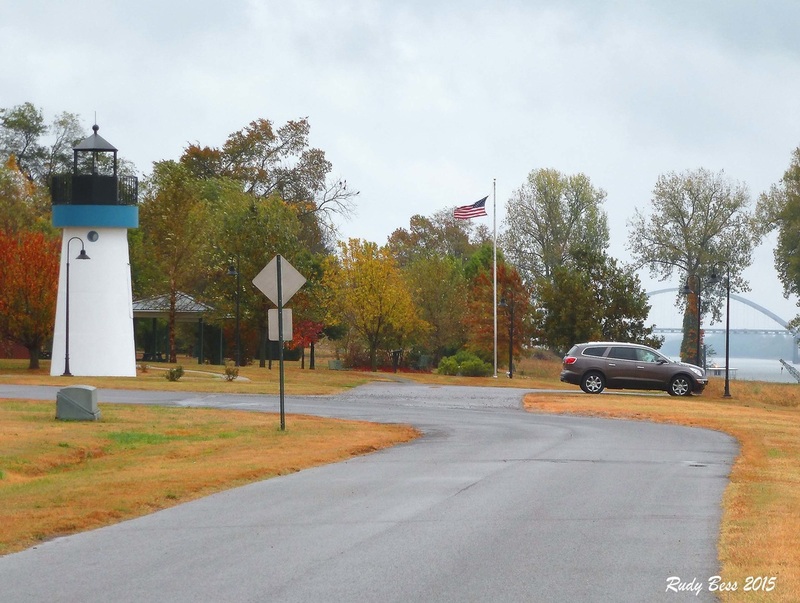 The land for the lighthouse in Dorothy Miller Park was donated by the City of Metropolis. The lighthouse was designed by Eggemeyer Associates Architects in Carbondale. Illinois at no cost. Cement for the project is donated by Lefarge of Metropolis and the Concrete will be provided by Kotter Ready Mix of Metropolis also at no cost. 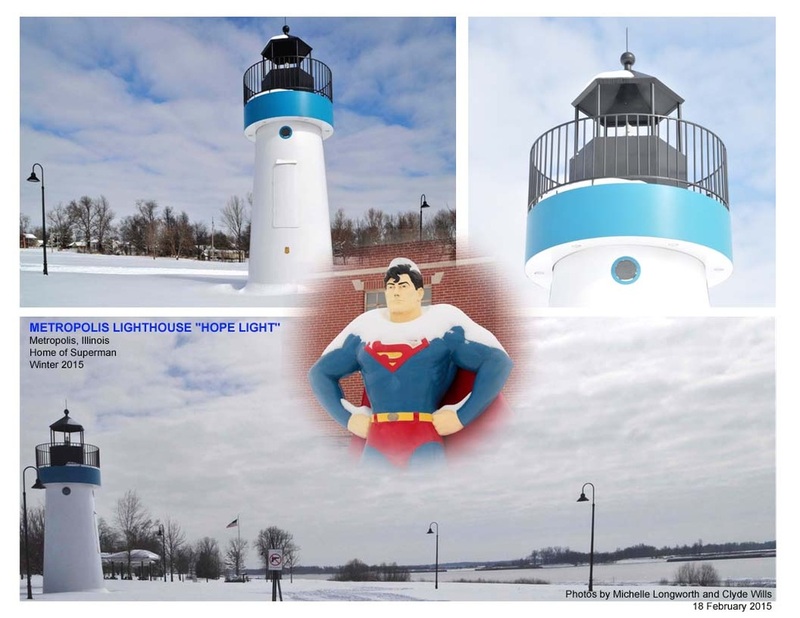 Lighthouse construction is being accomplished by Parker Custom Machine Shop in Metropolis. 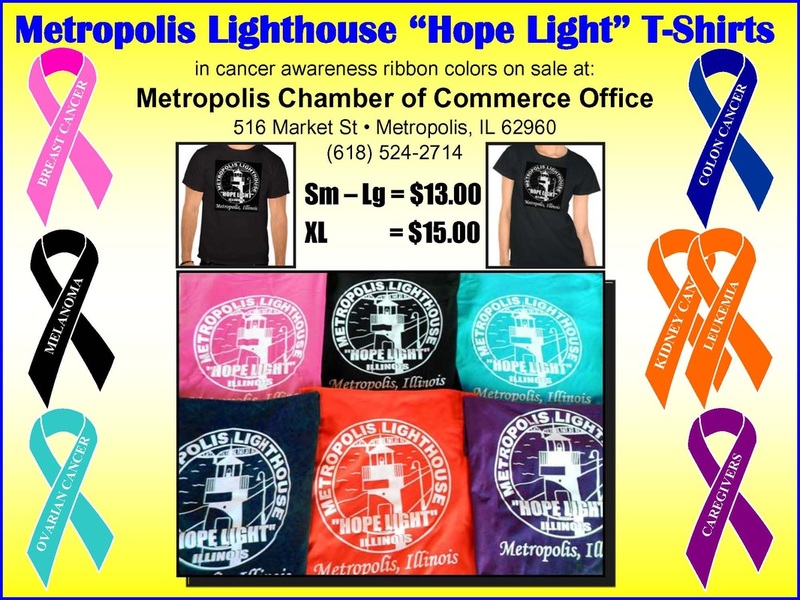 The Metropolis Hope Light project is a 501(c)(3) nonprofit public charity doing business as (dba) an entity of The Hope Light Foundation with all donations being tax deductible. 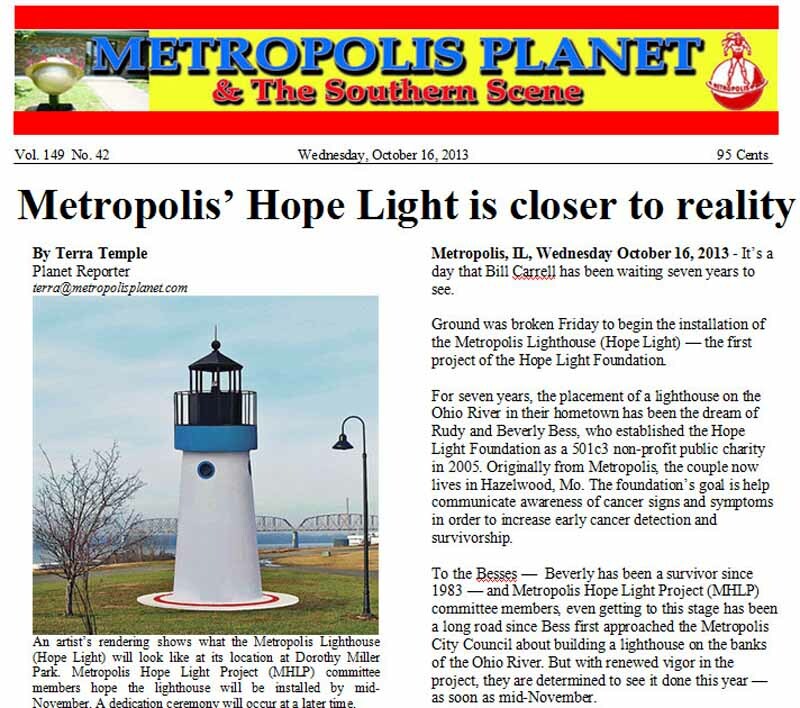 For more information on the Metropolis Hope Light Project, contact us through our Contact Us tab. 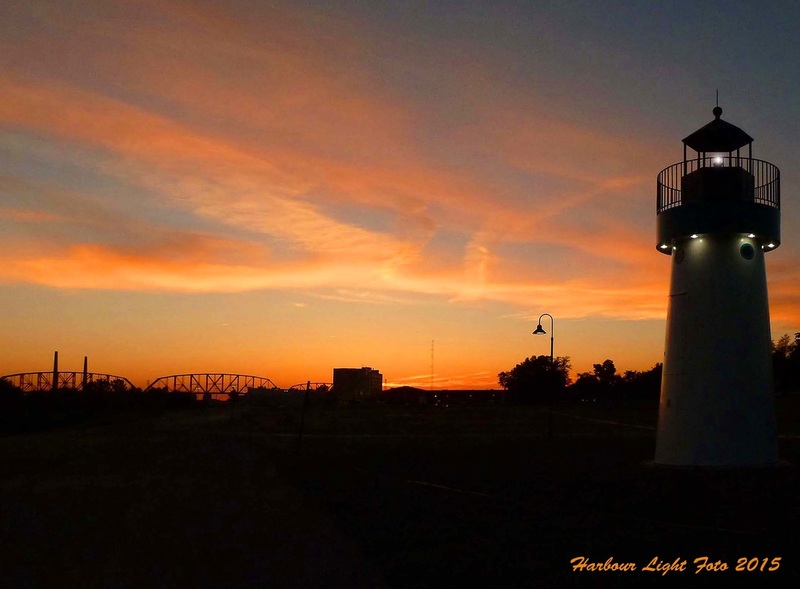 Beautiful sunset photo of the Lighthouse taken by Byron Hetzler of the Southern Illinoisian Newspaper. It was published in the newspaper on 8 June 2016.
serves as a national "Beacon of Hope" for cancer patients and survivors, for raising funds to help national cancer research organizations and for funding local activities to help reduce the financial burdens of cancer patients. 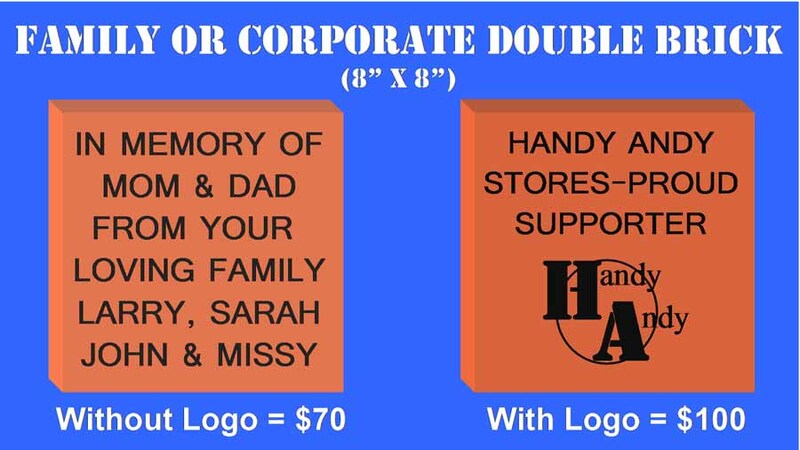 Please join us in this first-of-a-kind project dedicated to the fight against cancer.